Let's talk about the amazing resources that are cooking videos. And how you should really use them BEFORE embarking on DIY food projects to avoid wasting 24 hours and precious heavy cream. What happened is that as soon as Deb posted this gorgeous Peach and Crème Fraîche Pie on Smitten Kitchen, I made plans to bake it. No surprise there. Isn't that everyone's usual reaction to ALL her posts? Anyway, I hit a roadblock in the form of a $6 price tag on the tiniest tub of store crème fraîche. But I grabbed heavy cream instead and set about making my own. Oh how I wish I'd known then about this video which quickly walks through the whole (and truthfully damned easy) process. 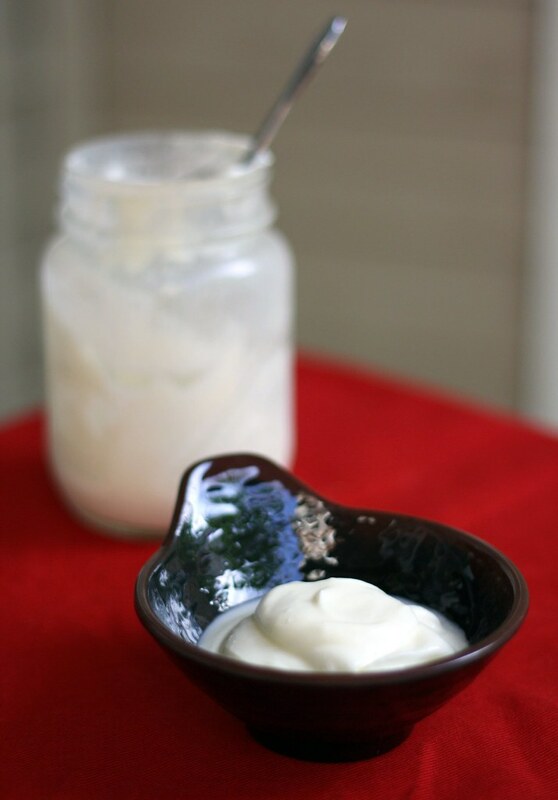 Then I'd have realized that crème fraîche remains fairly liquid even after the culture develops. That the subsequent chilling is when it develops that characteristic luxurious thickness. Instead, I dumped out the first batch in my ignorance. But all's well that ends well, and I honestly can't look at that lovely second batch (or the crumble it went in) and regret this journey to deliciousness =). Oh, but of course there was another problem to come. I utterly FAILED at crust-making. This was my first attempt from scratch, and what I got can't even rightly be called a "crust." What came out was a greasy heap of melted butter-drenched dough. The other crust problems I've read about seem to deal mostly with toughness, and I've had little luck finding info matching my flop. My guess would be that large butter chunks, extra water, and the dough becoming too warm were the culprits. I'd love some help getting to the bottom of this though. NOTE: I made a crumble but left the crust instructions so I can re-attempt the pie later. Prepare pie dough: Roll out pie dough to about 1/8-inch thick and fit into a regular (not deep dish) pie plate, 9 1/2 to 10 inches in diameter. Trim edge to 1/2 inch; fold under and crimp as desired. Pierce bottom of dough all over with a fork. Transfer to freezer for 30 minutes. Preheat oven to 400°F right before you take it out. Make streusel: Stir sugars, cinnamon, baking powder, salt and three tablespoons flour together in a small bowl. Add bits of cold butter, and either using a fork, pastry blender or your fingertips, work them into the flour mixture until it resembles coarse crumbs. Add additional flour as needed; I needed to double it to get the mixture crumbly. Set aside. Par-bake crust: Tightly press a piece of aluminum foil against frozen pie crust. From here, you ought to fill the shell with pie weights or dried beans, or you can wing it like certainly lazy people we know, hoping the foil will be enough to keep the crust shape in place. Bake for 10 minutes, then remove carefully remove foil and any weights you have used, press any bubbled-up spots in with the back of a spoon, and return the crust to the oven for another 5 to 8 minutes, or until it is lightly golden brown. Transfer to a wire rack to cool slightly. Reduce oven temperature to 375°F. NOTE: Deb of Smitten Kitchen explained that the par-baking isn't absolutely necessary since this pie probably wouldn't become soggy even without it. 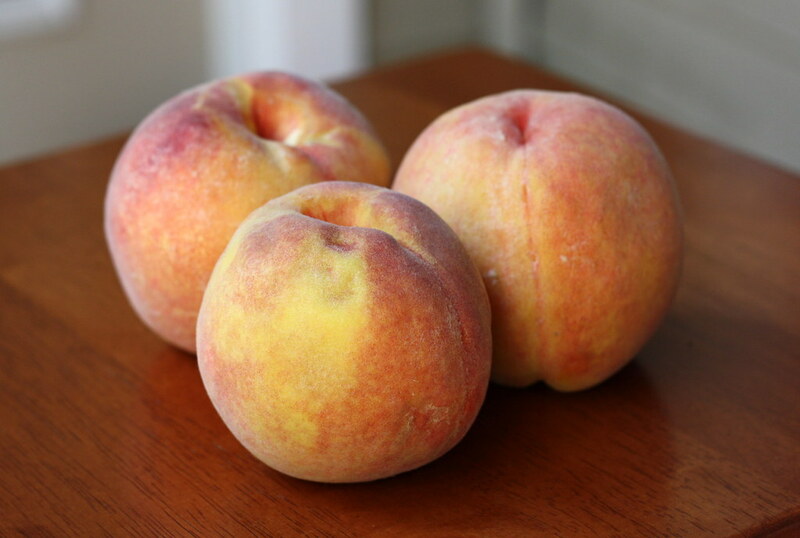 Make the filling: Sprinkle quartered peaches with sugar and salt. Let sit for 10 minutes. 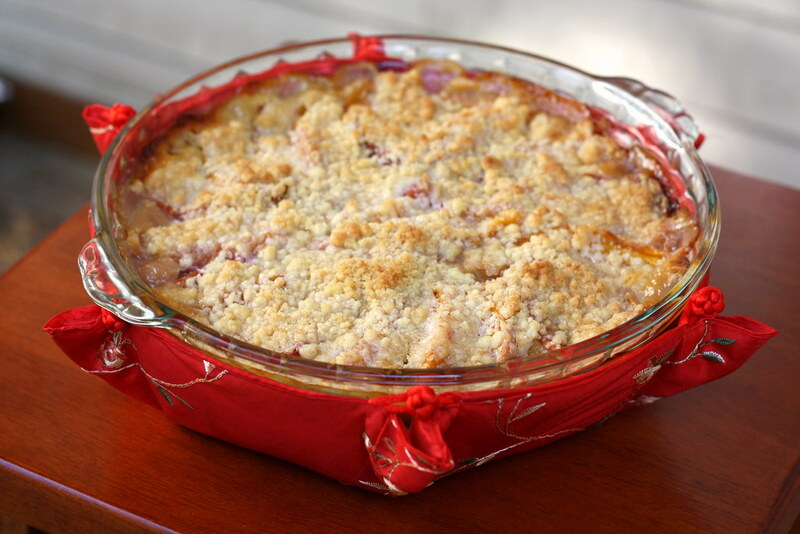 Spread two tablespoons crème fraîche in bottom of par-baked pie shell, sprinkle with one-third of the streusel and fan the peach quarters decoratively on top. Dot the remaining three tablespoons of crème fraîche on the peaches and sprinkle with remaining streusel. Bake the pie: Until the crème fraîche is bubbling and the streusel is golden brown, about 50 minutes. Cover edge of crust with a strip of foil if it browns too quickly. Let cool on a wire rack at least 15 minutes before serving. NOTE: Deb recommended storing this in the fridge due to the crème fraîche and because it tasted even better cold. I didn't get a chance to try this since I took the pie to work but will happily take the excuse to make it again! That looks So good1111 I love creme fraiche with fruit! Thanks, Jennifer! The combination was great. I'm really glad I discovered creme fraiche. Better late than never =). hi, your peach crumble looks lovely. i made smitten kitchen's peach and crème fraîche pie a few weeks ago and i loved it. i have no problem with crusts, it seems that the more you make them, the better they turn out, so i'm sure you'll master the crust. but i can't find crème fraîche in my country, so i used sour cream. it was delicious.